Out of stock since Tuesday, 9 October 2018. Due back Friday, 26 April 2019. Out of stock since Thursday, 18 October 2018. Due back Friday, 26 April 2019. Out of stock since Wednesday, 10 October 2018. Due back soon. The Stubbs Super Mate is an improved manure collector which is ergonomically balanced. The handle is 10cm lower and 10cm further forward compared to High Stable Mate, putting your hand over the load. Combines shatter resistant Stubbythene moulding with high quality powder coated steelwork. 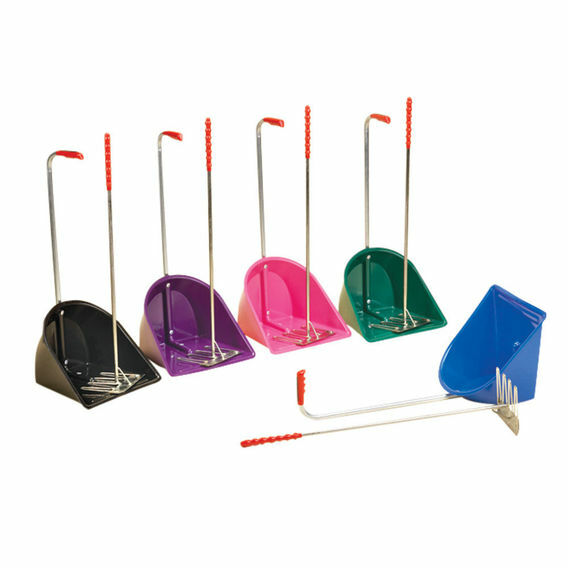 Simple drop-in storage for the long length rake. The Super Mate comes with the colour coordinated rake. There are currently no questions for Stubbs Super Mate Manure Collector With Rake - be the first to ask one!